Over the course of the week it became obvious that most of the kids did not differentiate between themselves and their characters – they weren’t acting like someone else often, and it took a long time to get them familiar with their class-specific skills and attributes. In future, I’d love to start a program like this off with some basic improvisational warmups, to introduce the idea of acting and being “in character”, and then spend some time getting each player to break down their stats and character info into notes for themselves on what kind of person their character is. On the same note, while creating the bonds was a lot of fun as part of the character creation process, the kids largely seemed to ignore them or feel hampered by them as they got farther into the story. It might be better with a crew of new roleplayers to let the bonds emerge naturally in play and make sure to record inciting events when they happen, giving the kids more investment in the bonds themselves. As I mentioned in my previous post, it took a little while to sell all the kids on the fact that if they said it happened, that meant it happened, and they were going to have to deal with the consequences. Every GM found their own balance between asking “really?” when kids were being impulsive or sarcastic, or saying “if you say so!” and then enforcing the consequences of said sarcastic or impulsive approach. Dungeon World does not include initiative order or taking turns in the ruleset, but the best advice I got leading up to the class was that kids would need that structure, so I imposed it immediately upon my group. I was looser with it when kids were exploring, but for combat we went around the table rigidly, and the turn order could only be adjusted by players willingly forgoing their turn in favour of a teammate getting to do something faster. Dice was an even bigger deal, I think, than the turns, and I definitely made the mistake of not laying down universal dice management rules at the get-go. In the end, each table found their own best practices – for mine, kids had their own pair of d6s, but could only roll them in a felt-lined bowl (this kept dice on the table) and damage dice were shared and stayed in the middle of the table. We had a few talks about rolling or playing with dice when someone at the table was talking or doing something important, and after a few sessions my group got the hang of it, were more focused and were making less distracting dice noise. Keeping kids aware of and focused on the story of their game was a struggle as well. We gamed twice a day, and even though the sessions were only two and a half hours apart, we always had to recap. Some groups were more invested in the story from the get-go and made sure to keep track of it collectively; others, like my group, were split – half of them were obsessed with every plot detail, while the other half were detached unless things were actively happening, and needed constant reminders of who their allies were, and what clues or treasure they had. One thing that really helped with this was the journals the kids made on the first day, but I’ll go into that further in a future post. The final challenge was the most predictable: players were not equally committed to their individual quests and any efforts towards running linear campaign experiences were futile. That said, we knew that was coming and the GMs handled everything very well. 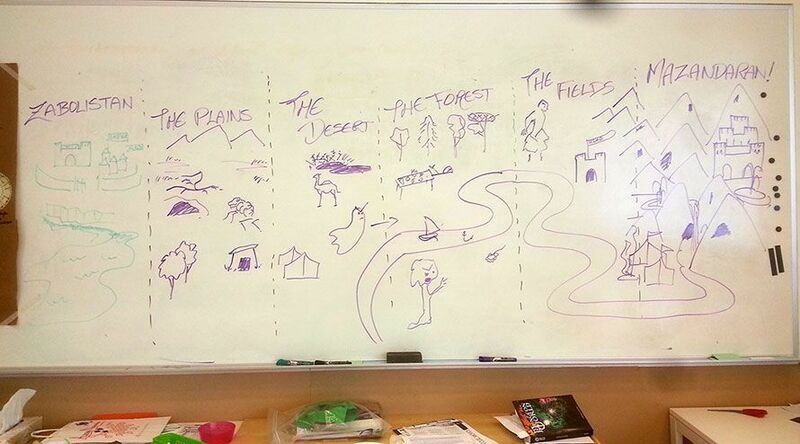 Since the campaigns were all following the Shahnameh, even when the kids stopped caring about their particular quest, they could look to the shared map on the wall and still felt interested in getting to the far side of it, which I think helped a lot. This is another thing I’ll talk about more in future posts, but FYI, thank goodness for maps. While I was concerned that the three GMs assisting me were not experienced at GMing, it turned out they all brought fantastic experience with educating kids, oral storytelling, improvisation and making the most of the museum space to our games, which was a huge help with the camp as a whole, and specifically in the context of GMing. For example: where I had trouble getting all four players to listen and focus when I described something important, another GM had the wise approach of getting his kids to all close their eyes and visualize while he described something. Frankly, I’m using that trick for my next adult game, it worked so well. Another of my GMs recommended on the first day that we try and assemble gaming groups out of kids who didn’t know each other very well, as opposed to putting siblings or close friends in the same game. This sounded almost cruel to me, but I could see the wisdom in helping kids start fresh, socially, in their gaming group, and I think it worked out really well in the end. And while we did have a few kids who were reluctant to play, or to get invested in the game or take charge in specific situations, the class system meant the GMs could easily create situations where only one player could solve the problem, thanks to their specific skillset. Making reluctant players necessary to the group’s success helped them invest and feel important. For other reluctant players, they knew their role and didn’t resist doing what was mechanically necessary, but took longer to become invested in the story. I found what worked best in my group was giving them a common enemy – not just a vaguely evil NPC or monster in the distance, but a constantly present NPC who was being cowardly, lying to the group, screwing things up in ways that sabotaged them, and generally being a problem no matter what they tried to do. When they all rallied against her, even my most reluctant players became invested in seeing the quest through and dealing with her frustrating behaviour. While there were a few kids who were so quiet, we had trouble telling if they were enjoying themselves while they played, by the middle of the week their parents were sharing with us the stories they’d been told by their kids after camp each day, and it became clear that even the quietest players were excited to be a part of the game. The biggest success, though, and the most exciting aspect of gaming with kids, was watching each group learn to collaborate and work together as a team. As they learned more about what each class could do, players would delegate different tasks to one another. As they expanded the stories of their games, players would keep each other up to date on clues, developments and plans. And when the going got tough, players became experts at quickly planning battle strategies with an understanding of each player’s skills and strengths, the order of the turns, and what kinds of monsters they were up against. Players also became the GM’s best friend at catching impulsive, sarcastic or dismissive comments from one another before they became Game Reality, reigning one another in and keeping the focus on the group’s goals and safety. It was thrilling to see the kids both take on the responsibility of creating the story they wanted, and to collaborate and delegate creatively while they did it. We played before lunch, and at the end of every day of camp, and even though we’d all been on our feet, running around after the kids or improvising gameplay with them, all four of us GMs were often a little euphoric at the end of each day, thanks to the amazing energy the kids brought to the gameplay. So yes, it was awesome, and I would 100% recommend trying gaming with kids. Thanks again to my patrons who make these posts possible! Next week’s post will be on whirlwind setting design and writing four campaign seeds that share the same map, follow in the same hero’s footsteps, and have room for all the chaos of gaming with kids.